Finally got some low humidity and was able to paint. We have 7 days of sunshine if the weather lady is right. Any still available for sale? 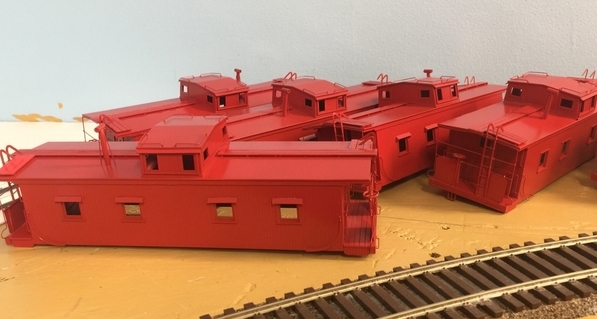 Just saw a similar Southern caboose, think brass, in Chicago O scale show, and a Mullet River kit for a Southern caboose there, too. Are you back to doing O scale cabeese, for others? MR150, Yes. I will work until the end of the year. I am catching up on backlog after 3 surgeries and will take a few more orders until then. I am retiring from all three of my jobs in December! After that I plan to travel some and work for me. VGN, these are all spoken for. Des Plaines Hobbies bought Mullett River and they said last year they plan to bring all the kits back in production. Good to see you are back at the work bench and producing lovely models. Are you still going to do the couple of projects we have discussed in the past ?